With about 10 percent of fatalities on highways in the U.S. involving commercial trucks, it’s an unfortunate fact that big vehicles are commonly associated with injury and death. 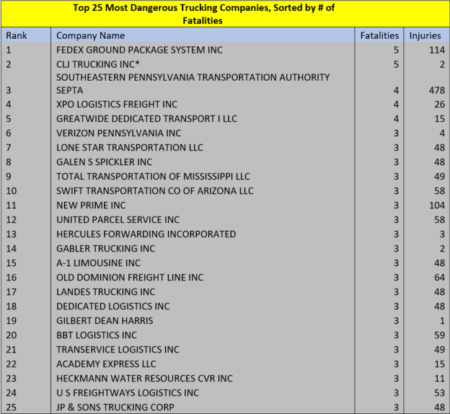 A new report from Keep Highways Safe (KHS), a non-profit based in Pennsylvania, has revealed that in the Keystone State alone, there have been 381 deaths and 7,728 injuries involving large, commercial vehicles since 2015. KHS’ report discloses the 25 firms most responsible for fatalities and injuries for a two-year period on Pennsylvania’s roadways, respectively. The report reveals how 16 of the top 25 culprits appear on both lists—i.e., they are amongst the most responsible for both deaths and injuries. FedEx, responsible for five deaths and 114 injuries over the period, in particular, has stood out among other fleets in the state. New Prime Inc. also surpassed the 100-injury mark with 104, to go along with three fatalities. Other firms distinctive for their rate of accidental harm included First Student Inc., Old Dominion Freight Line Inc. and the United Parcel Service (UPS). 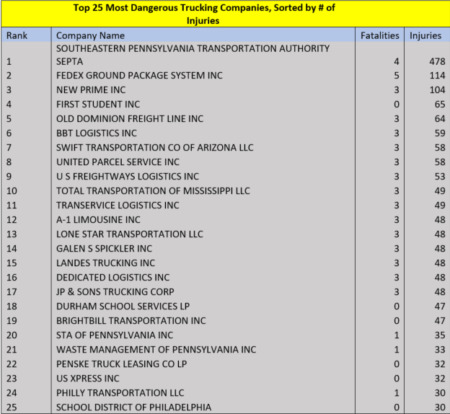 The Southeastern Pennsylvania Transportation Authority (SEPTA), was the entity that ranked first for total injuries by a large margin with 478. Comparatively, they were responsible for a four deaths. Every firm that made the list for most number of injuries was responsible for no fewer than 30 fewer injuries over the period examined. Overall, commercial trucks and heavy-duty vehicles are responsible for 2.3 deaths and 60.5 injuries for every 100 million miles driven in the U.S. Meanwhile, fatal accidents caused by big rigs cost American taxpayers over $20 billion a year, almost two-thirds of which is associated with loss of quality of life. The state of Pennsylvania has seen a significant decrease in its rate of fatality across all motor vehicles in recent years—there were only 1,200 crash-related vehicle deaths in 2015, the state’s second-lowest rate over the past 86 years. Still, it is clear that there is much more improvement to be made on the macro level, particularly amongst trucking companies. Keep Highways Safe, which collected and compiled the data used in the report, is a leading advocate of strong safety regulations for commericial trucking fleets. Solnick, an attorney by trade, runs the law firm Solnick & Associates LLC, just north of Philadelphia. Solnick has championed previous legal and regulatory changes in the sector, such as those relating to HOS regulations.